Assuring reliability in automotive electronics has set off a scramble across the semiconductor supply chain and unearthed a list of issues for which there is insufficient data, a lack of well-defined standards, and inconsistent levels of expertise. Reliable functional safety that spans 18 to 20 years of service in harsh environments, or under constant use with autonomous taxis or trucks, is a massive undertaking that will require engineering advances in areas such as artificial intelligence, LiDAR, radar, and vehicle-to-vehicle communication. And it will require management of a global supply chain that is populated by startups, chipmakers with no automotive experience, and automotive suppliers with little experience in advanced electronics. At this point no one knows exactly how reliable a 7nm AI system will be, or how effectively it will fail over to another system in case of a malfunction. In fact, no one is even sure what are the right questions to ask during testing. Communication among all the suppliers up and down the supply chain has to be clear and open, yet some suppliers protect their IP by withholding important data, leaving car manufacturers to discover some data for themselves. To make matters worse, the rules for pulling all of this together are spotty, at best. The lack of governmental regulations on self-driving cars leaves the consumer at the mercy of a competitive, nascent autonomous vehicle (AV) industry. But these industries have a lot to lose if they fail. That economic threat combined with the continuing evolution of the ISO 26262 standard, may be the saving grace. 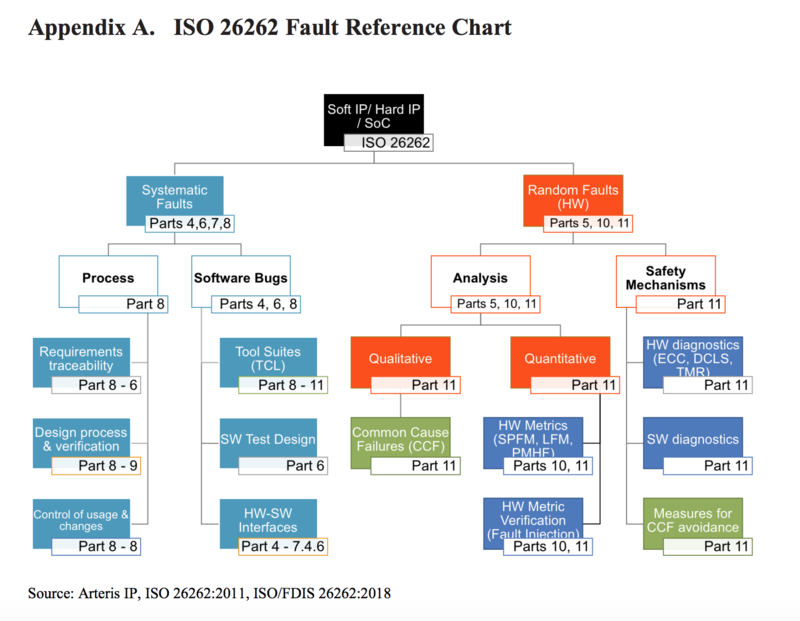 ISO 26262 requires tracking all materials and parts at all points in procurement and manufacturing, setting the stage for a culture of safety behavior and cooperation among suppliers. A post-mortem diagnosis of failure looks like an aeronautical investigation. It almost goes without saying that the testing and tracking process is more expensive for safety-critical systems especially, whereas reliability and good quality are still important selling points for non-safety critical systems, like infotainment. Most automotive chips aren’t developed at advanced nodes. But the ones that require massive compute power to make split-second safety-critical decisions, such as AI, will require the highest density available. That creates reliability questions that have largely been ignored at advanced nodes because most of the chips developed using those processes are used in consumer devices or controlled environments. All automotive electronics—especially safety-critical parts and systems—now undergo rigorous testing during and after manufacturing. The goal is to weed out chips with infant mortality or child-sick devices: the devices that are going to fail early. One of the issues with reliability is it directly proportional to cost. In design of automotive safety critical components and systems, up and down the supply chain each supplier has more steps to do, which adds more test time and requires more tests, which in turn drives up the cost. And while strategies are being developed to test more concurrently, the cost continues to rise. There are two different approaches to solving this problem. One is to utilize system-level test, which is more expensive but allows testing to be done in the context of an actual system. It’s not clear yet whether system-level test will actually increase the overall cost, though, because temperature typically requires three different insertion points, while it could be just one with system-level test. The other is focus on cost first, and to figure out what may or may not be necessary to test. So there are quality measurements and methodologies for dealing with that, and procedures for what data needs to be stored. Everything is logged and registered the way it is done with airplanes, and it is supposed to be kept for 15 to 20 years. But even that may not be sufficient. The whole automotive supply chain has to be involved in a safety culture now in the effort to make automotive systems reliable and safe. Reliability is a team effort. That’s one piece of the puzzle. The other is understanding exactly who plays where in the supply chain. Automakers are looking to the chip industry for detailed data on degradation models, much of which doesn’t exist yet. In the past, the supply chain used a waterfall model, where the OEM would give a spec to a Tier 1 supplier, and then they would decide which Tier 2 player to involve, and so on down to Tier 3 and Tier 4. 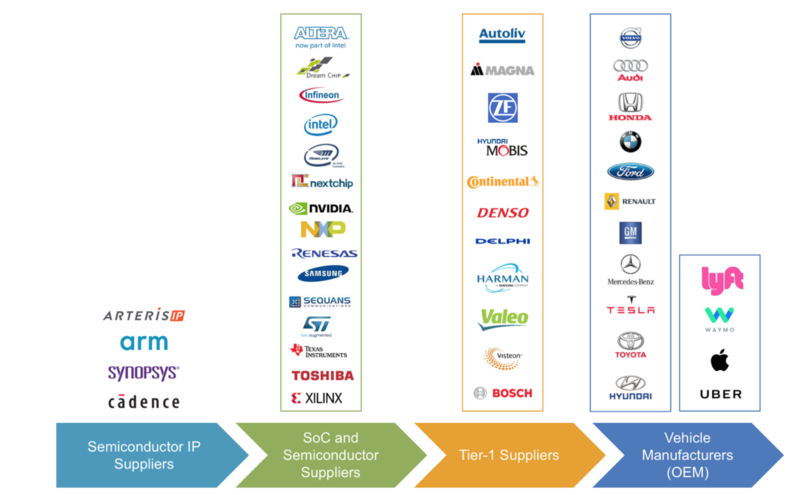 The automotive supply chain reaches deeper and farther than just chips and IP. It also includes materials that are used to create chips in the first place, as well as the materials that are left when the manufacturing processes are complete. All of this has a big impact on reliability of automotive electronics. But it also raises some interesting questions about reliability in the first place. There are two issues that are creating reliability concerns on the automotive side. One is soft errors in the electronics. The other is the more classic type of fault. Reliability in automotive vehicles means users can depend on them to work when called upon without any performance issues and need for repair. Over time, how often the vehicle doesn’t work as advertised or is completely out of commission will give users a feel for the conveyances’ overall dependability. Hall noted that code running on sensor fusion devices will change over time, as well. In general, automotive reliability is improving. J.D. Power found that reliability rose 9% in three-year-old models (2015 models, surveying owners in late 2017). Less than three years may be a good time for an initial assessment of a car’s general dependability, but 20 years—and zero defects in safety systems—is the expected life-time of a car. Overall, cars now average 142 problems experienced per 100 vehicles (PP100). The most reliable vehicles in the study hit 99 to 100 PP100. While this is good news for the auto industry, there’s still a very long way to go. What needs to be tested, and what’s the best way to make that happen? Each new level of assistance and autonomy adds new requirements and problems, some of which don’t have viable solutions today.